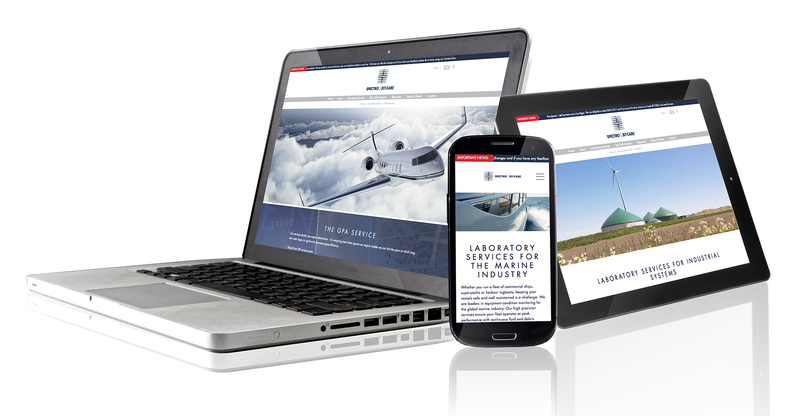 We are very pleased to announce the launch of our new and refreshed website which continues to offer our customers the best online experience. With increasing numbers of people using their smart phones to browse the Spectro | Jet-Care website, the new responsive design moves away from the ‘fixed width’ approach to give mobile users a better experience. With easily accessible information and improved navigation the ‘responsive’ layout allows content to adapt fluidly on different devices, from desktop PCs through to tablets and mobiles. A revised site map has also been implemented to allow visitors to navigate with fewer clicks as well as a news ticker highlighting important news and announcements. Visitors will also benefit from a much improved ‘Resources’ section with access to sector specific collateral and case studies, all available for immediate download. For laboratory customers, the ‘Total Analysis Program’ section has been extensively reworked allowing visitors to see ‘at a glance’ the wide variety of analysis tests available across the Aviation, Marine and Industrial sectors, and click through to read individual test information if required. For those visitors wishing to find out more about Jet-Care’s Gas Path Analysis (GPA) engine trend monitoring service the website has an improved engine portfolio section highlighting the extensive list of bespoke trend programs available. A number of quick links highlight important services including webECHO™, the Spectro | Jet-Care online portal allowing 24/7 access to reports, trends and data, as well as the app for iPad, iECHO GPA™, for engine data submission to the Jet-Care team for trending. The new website is part of our commitment to continuously review and adapt our services to ensure that every customer receives a first-class service at every point of contact, as well as ensuring that the latest news and information is available whenever they need it.